Storing images on your phone can sometimes fill up a lot of memory card space – one that you may need more for other apps or files. The Google + Android app offers a solution to store your photos in a private folder on your Google + account automatically, depending on your settings. Here’s how you can store and retrieve your photos using this app. Open your Google + app on your phone. Tap on your phone’s Menu key and go to Settings. Tick on the box beside Turn On Instant Upload. You have an option to only upload over Wi-Fi or both Wi-Fi and mobile data connection. To upload your existing photos and videos, you can tap on Upload Now. This may take a while so make sure you have enough idle time on your hands. Note: Syncing photos that was recently taken requires you to be connected to the Internet, so it will only happen when you have Internet connectivity. 3. Log on to your Google + account in your desktop. On the top bar of the screen, click on the photo icon. 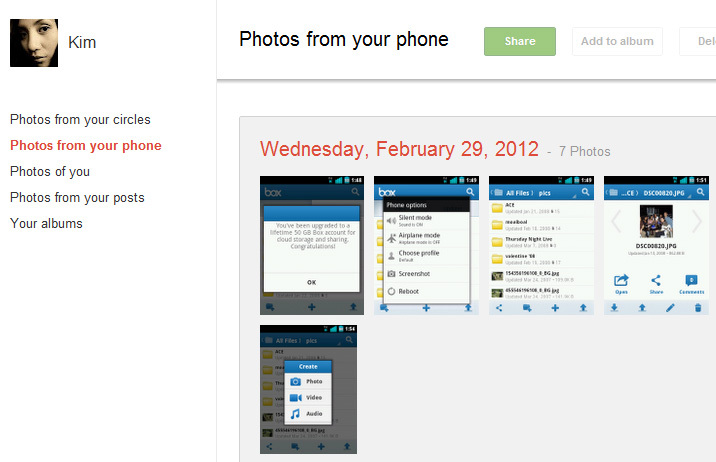 You will get a sidebar on the left side of the screen for photo categories – click on Photos from your phone. You should now see all photos uploaded on this folder. Note: This is a private folder and only when you share these photos will it be shown in your profile. You also have other options when you view your photos on your Google + account from your desktop. You can share it to your Circles (or publicly) or you can download the full image to your computer’s hard drive. Google + Instant Upload is definitely a useful feature that makes this app more than just a social network tool. With this automation, there’s no need for other file storage apps on your phone. Instant Upload does it all for you!